77 talented athletes from Barnet will benefit from a £42,000 fund – thanks to charitable social enterprise GLL. The athletes will be supported through the GLL Sport Foundation (GSF), the largest independent athlete support programme in the UK, which this year marks its 10th year of support today and tomorrows athletes – READ MORE. The athlete awards cover Olympic, Paralympic, Deaflympic, Special Olympic and Commonwealth sporting disciplines. With a staggering 90% of award recipients receiving no other sport funding. 72% of recipients are aged under 21, the Sport Foundation has highlighted a vital funding gap for young talented athletes currently competing at National and international levels. GSF Patron and former Olympic Champion Sally Gunnell explained the core role the GSF takes in supporting the next generation of athletes and thus ensuring a sporting legacy is in place for future generation: “Sport is such an important element in our lives whether that be as an athlete; a coach or within the wide network of support, sport can and will continue to deliver so much for us. This was seen once again from the euphoria that gripped the Nation during the World Athletics Championships last year”. 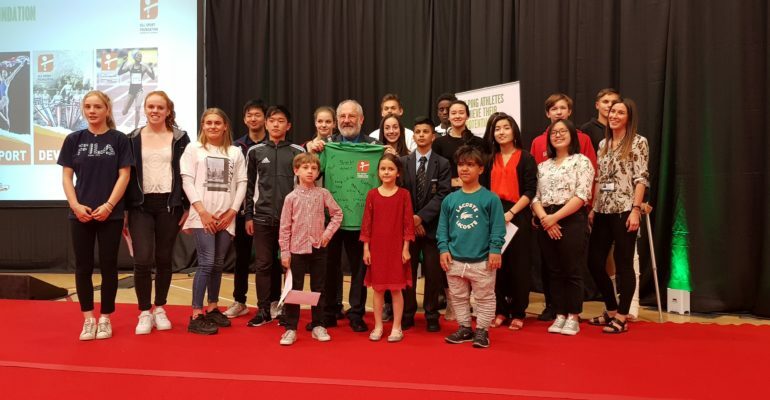 “It was fantastic to see GLL Sport Foundation supported athletes deliver medal successes and others to break through to the international representative level. It is a core ambition for the Foundation to be successful in supporting both today’s and tomorrow’s athletes”. Peter Bundey, GSF Chair, paid tribute to the athletes, programme stakeholders and also highlighted the impact the Foundation is making: “The wealth of young sporting talent within our local communities is truly inspiring. We are delighted to play our part in supporting the development of sporting talent across in every region in the where GLL operate sports and leisure facilities. We believe that the vast majority of the athletes that benefit from the GLL Sport Foundation will give something back to sport and society in a positive way; whether as a future champion inspiring the nation, sports coach, volunteer, fund raiser or as an inspirational role model to other young people to get active and involved in sport”. “I would like to thank all our partners and sponsors for their support for the programme. SportsAid, SportsAid Wales and Mary Peters Trust provide the direct links to Sport Governing Body talent pathways, whilst our many corporate sponsors headlined by GLL and Technogym, numerous local authorities, university and physiotherapy partners directly contribute to support these sporting dreams to become a reality”. Since its launch in 2007, the GSF has provided over 16,000 athlete awards at a total support value of over £9 million across the UK. The Gold coast Commonwealth games were historic successes for home nations, and the GSF supported athletes also broke the Foundation’s record medal haul with 18 medals won between the 60 athletes that competed. Supported athletes receive Award packages that include financial grants of up to £1,250, free training memberships enabling access across 300 GLL and partner operated sporting venues along with access to sports science, medical support and employment opportunities all focused towards supporting their athlete journey. Find out more about GLL HERE.